Raise revenue. If a country produces no oil, levying a tax on oil imports will raise money as people have no alternative put to pay the import tariff. A tariff could be placed on goods who may have negative externalities. e.g. The most common reason for a tariff. 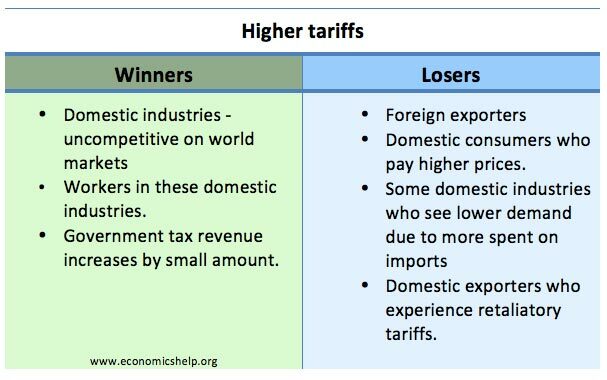 Imposing import tariffs makes domestic firms more competitive. Trade liberalisationinvolves removing barriers to trade such as tariffs on imports. Free Trade areas will have no tariffs between member states, though they may have a common external tariff if it is a customs union. Increase specialisation and benefits from economies of scale. Theory of comparative advantage states net welfare gain from free trade. The reduction of tariffs leads to trade creation. Should the U.S. impliment the purposed tarriffs? Will they be effective? Are they worth the repercussions, and will it continue to escalate? Should the U.S. implement the purposed tarriffs? No, we should not be implementing this type of tarriff. This is going to drive the price of electronic goods, medicine, and medical equipment, amongst other things. The price of medicine in the US is already sky high and we all know that any "tariffs" placed are just going to "trickle-down" to Grandma who needs the meds. They will be effective in raising the prices of goods we receive from China. The US is not known anymore for our great, cheap labor skills. Maybe we can get some jobs going here in the US to replace those products that no one can afford. Yeah, more part-time, minimum wage jobs with no benefits. Are they worth the repercussions, and will it continue to escalate? China is a powerhouse and I foresee they will rub Trump's nose in it for spite because they can. Third grade antics will ensue.